How much does it cost to travel to Liverpool? How much money will you need in Liverpool? £49 ($64) is the average daily price for traveling in Liverpool. The average price of food for one day is £9.88 ($13). The average price of a hotel for a couple is £66 ($86). Additional pricing is in the table below. These average travel prices have been collected from other travelers to help you plan your own travel budget. How much money do I need for Liverpool? Famous as the hometown of The Beatles, Liverpool is a maritime city on the northwest coast of England. Historically, it was a key port to trade and migration and still plays a major role today, its Pier Head Waterfront being designated a UNESCO World Heritage site in 2004. Beyond the waterfront, Liverpool is a large vibrant city with a thriving cultural heritage, historic landmarks, and a handful of unique neighborhoods with plenty to see and do. With such a long history, Liverpool has many historical landmarks worth a look, especially down by the port. The city was awarded six UNESCO World Heritage sites because of its role in the development of maritime technologies and its history as a major trade center through the 18th and 19th centuries. Most of these are civic and public buildings located near the waterfront, many open for tours and interactive activities. Some of the other UNESCO sites in City Centre include Pier Head, Albert Dock, and William Brown Street. There are also a handful of museums covering just about every aspect of Liverpool's culture and history. The Merseyside Maritime Museum, for example, located on Albert Dock, displays a range of sailing vessels and focuses on trade and emigration to the New World. Then, for the music fans, there is The Beatles Story-a museum dedicated entirely to the band with artifacts from their heyday and their lives in Liverpool. The city also has a few parks and green spaces with activities for all ages. Some of these include Otterspool Park with an adventure center boasting high ropes and obstacle courses, Sefton Park with over 200 acres of green space, and Calderstones Park with playgrounds, a café, and botanical gardens. The City Centre is the heart of Liverpool, bustling with people indulging in restaurants and bars, visiting landmarks and museums, and shopping. It is subdivided into many unique neighborhoods, each with its own cultural flair and history. One of these neighborhoods is the oldest established Chinatown in Europe, located at the southern edge of City Centre. Another is Canning-the Georgian corner of the city, with residential architecture dating from the 18th century. Albert Dock and Pier Head are also hubs of activity with plenty of restaurants, shops, and museums, while Ropewalks also has a number of clubs and restaurants great for the nightlife. The city of Liverpool is full of opportunity for historic sight-seeing and enjoying the cultural heritage that exists today. 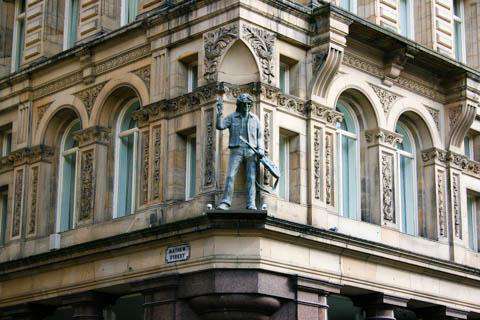 Each neighborhood has its own sights and flavors as well as its individual past as Liverpool has grown and changed. Walking tours are often a great way to get a feel for the city and how it was navigated during its earliest beginnings. Tours are many and varied, catering to all sorts of interests including ghosts, The Beatles, maritime history, and the history of the slave trade. If you are more interested in the dining and shopping scene, Bold Street is one of the top districts in the UK for shopping. You might also want to visit Liverpool One which, in addition to dining and shopping, holds festivals and events throughout the year. There are also a few football clubs for the sports fan visiting Liverpool. Everton is one of the oldest and most successful football clubs in England. They play at Goodison Park, one of the oldest football grounds in England. Liverpool Football Club is also one of the most successful clubs in the history of English and European football, winning eighteen English championships and a British record five European Cups. Liverpool plays at the iconic Anfield stadium which is just a short taxi ride from Liverpool City Centre. Other activities include shows and musicals at the Liverpool Empire Theatre, world-class music at the Liverpool Philharmonic Orchestra Hall, or Liverpool's Mersey River Festival usually held in June. As a center of culture in England, Liverpool has a rich and varied dining scene. Traditional fare of the country consists of anything you might find in a British pub-fish and chips, bangers and mash (sausages and mashed potatoes), stews, soups, and just about any kind of meat pie you could ask for. One of the more traditional dishes of Liverpool in particular is called scouse'-a stew made with lamb or beef and garnished with beetroot or red cabbage and crusty bread. Being a maritime city, Liverpool also serves up a good selection of seafood. But with such a diverse population, the city really has just about everything to cater to all tastes and budgets. English pubs can be found just about everywhere, but there are also restaurants serving Asian, Indian, Italian, American, and more. By plane, Liverpool John Lennon Airport has around 160 flights arriving daily from within the UK and Europe. The airport is also well-served by low-cost airlines like Easyjet and Ryanair. The next nearest airport is Manchester Airport which is about a 45-60 minute drive to Liverpool. It has a wide variety of destinations with frequent flights to North America and Asia as well as services within Europe. From Manchester Airport there is a direct rail service operated by Northern Rail to the Liverpool Lime Street Station. Liverpool is well served by frequent rail services to/from places like Birmingham (1h 40m), Leeds (1h 40m), London (2h 10m), Manchester (45 mins), Newcastle (3h), Nottingham (2h 30m), and York (2h 30m). Facilities at the Liverpool Lime Street Station include a ticket office, travel information center, help desks, left luggage, toilets, shops, cafes, pubs, and coffee and fast food kiosks. By boat, cruise liner ships berth in Liverpool City Centre, near the Pier Head. Regular ferries also operate year-round to and from Douglas, Belfast, and Dublin. By coach, buses are operated through National Express and Megabus.